Just hours ahead of the highly anticipated Apple Music launch, journalists who were lucky enough to test the streaming service have posted their first impressions. While any of these first-impression stories could serve as an answer to the question: is it worth paying USD $10 per month or USD $120 per year to use it, actually, you’ll have three full months – starting today – to try it and decide whether to take it or leave it. Overall, the reviewers were impressed with Apple’s service, although, as noted by Walt Mossberg of Re/code, there are some confusing aspects, such as the “New” section, where Apple apparently “jammed everything that didn’t fit anywhere else”. while the service does use some algorithms, it suggests numerous playlists, albums and songs curated by 300 human editors, based on your tastes. These curators include editors employed by Apple, and such well-known music publications as Rolling Stone, Downbeat and Pitchfork. 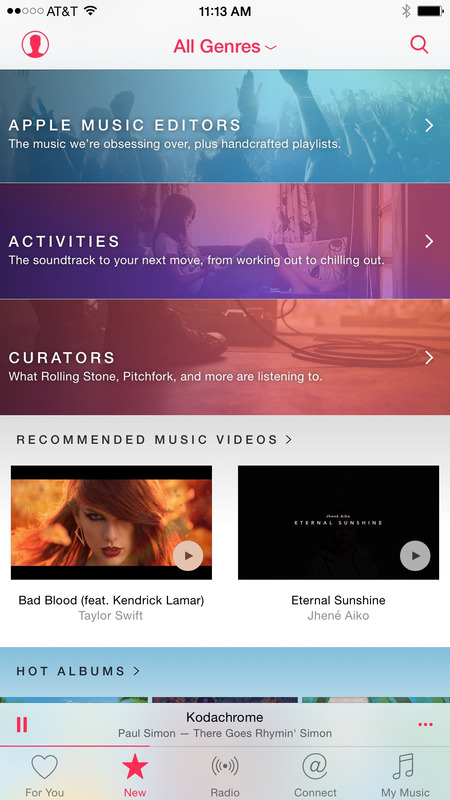 This was a key feature of the Beats Music service Apple acquired last year. In my brief time testing, I found that these curated suggestions and playlists were generally more pleasing and accurate, at least for me, than those created by algorithms alone. Much of the Apple Music experience really is Beats Music. And this is a good thing. I always thought Beats had the best discovery mechanism of the streaming services. With live radio, human curated playlists and access to your iTunes purchase history, I’m really liking Apple Music. […]For now, however, the For Me section alone has made me excited about music for the first time in a long time. And that’s a good thing. Apple has high hopes for the Connect feature that connects artists to fans. The artists you follow may post extra music and videos, photos, in-progress song lyrics, info on tour dates and more. Having indicated an interest in classical music, I found myself connected to the Berlin Philharmonic Orchestra where conductor Sir Simon Rattle in a video discussed streaming classical music. For all its promise, the Connect area seems pretty thin at the outset. “It’s somewhat of a discovery social network and you can’t do that until it opens. Day one is day one,” Iovine says. MIGHT NOT WORK: While some icons are intuitive — a heart represents the “You” section, or for favoriting an item, a vibrating dot symbolizes “Radio,” and users’ musical libraries can be found under iTunes’ signature musical note — the star icon for “New” might take some getting used to, since it has usually been used as a ratings metric for songs (and for flagging important emails, but we won’t bring Google into this). Usability in general, while remarkably streamlined for such a complex product, might still prove to be a challenge: SPIN was walked through in an hour and 15 minutes and there were still some matters that needed clarification, while users have online guides as a resource — and, of course, the ever-helpful Geniuses. The app also has a curators section that’s pretty handy — basically playlists curated by publications and whatnot. It’s pretty similar to what Spotify has done in the past, but I was still pretty stoked to add some of my favorite pubs’ picks to my music library. Also, I totally want to curate a playlist — it would be really weird and amazing and would contain many, many songs that one could mosh to. Call me, dudes. With a mix of curation, or human intervention, and a revamped algorithm, Apple has brought their radio service to a level where it is exciting. The amount of work that went into making just the radio portion of Apple Music perform properly is astounding. I’m damned impressed. Apple Music is a quality service, with the right mix of human curation and algorithms to help users figure out exactly what they want to hear. I can only imagine that the service will only get better from here. The more I use it, like/dislike songs, the better it will know me. I was interacting with Apple Music the entire time I was writing this and the radio station I started listening to improved quite a bit in those hours. I’m not skipping songs, instead I have a steady diet of Slash, Godsmack, Led Zeppelin, and Metallica. It’s hard to beat that. Apple Music is set to go live today at 9:00 a.m. Pacific time, but not before you upgrade to iOS 8.4. Apple will roll out the update at around 8:00 a.m., so get your devices ready!